GOLD COAST, Australia (AP) — Marc Leishman’s quest for a first professional victory at home made a good start with a 4-under 68 to sit two strokes behind the Australian PGA first-round leaders on Thursday. Leishman, starting on the 10th, had two bogeys and two birdies on his first nine before making birdie on four of his final seven holes at Royal Pines. Leaders Jake McLeod and fellow Australian Matt Jager shot 66s, and led by one stroke over Jae-woong Eom and Dimitrios Papadatos. Leishman, who was in a group tied for fifth, said his round could have been better. American Harold Varner III, who won the tournament in 2016 and has finished second in a playoff and sixth in three Australian PGAs at Royal Pines, shot 69. Defending champion Cameron Smith shot 70, as did England’s Andrew “Beef” Johnston, who recovered from being 3 over after three holes, when he was talking of quitting his round. Starting on the 10th, Johnston hooked drives on the 10th and 12th holes into water hazards. Australian veteran John Senden had an air swing on the par-5 ninth hole after the shaft on his driver flexed and snapped in his grip during his downswing. It left Senden off balance and wringing his right hand, and led to a long discussion with the rules officials. Senden argued unsuccessfully that on feeling the club snap, he attempted to pull out of the shot. 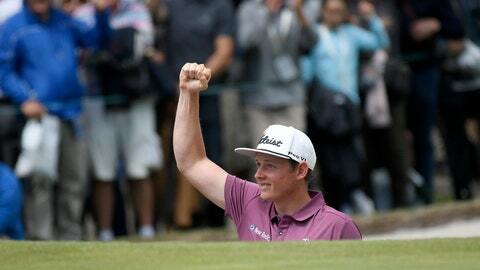 There was no penalty recorded but the shot counted as Senden’s second and he went on to make a bogey 6. He shot 72.